Okay, so being totally honest, there was a time in my life when I honestly thought that spinach was the only green I needed from the apothecary, even if sometimes I wished it didn’t turn into a bog monster when cooked. Everyone raved about all those other greens which looked like plants growing by the roadside (remember, this was before I journeyed to Skyrim and learned that harvesting and drinking roadside plants was WAY more fun than an epic dragon-slaying adventure)! Kale was introduced to me as a green that stayed intact better than spinach when cooked. I was skeptical to try using it in my own potion-making, but, as time passed, I found I preferred it to spinach in nearly every cooked dish. I still love spinach in salads, smoothies, wraps, but when it comes to putting greens into soups, pasta, or other cooked dishes, kale is king! It’s got a great texture and never gets as mushy as spinach does! It’s also quite mild when cooked, and complements lots of different flavors. When you need a quick side dish, it’s hard to go wrong with half a bunch of kale, de-stemed and torn into bite-sized pieces, then cooked up quickly to keep any dish company! This quick side dish works great with curly kale, but I’ve also used Russian and Tuscan Kale… okay, and lots of other greens, but you don’t get to shout “CHAAARD” in the same “KHAAAAN!” way as you can with kale! Heat up oil in a large skillet (with a lid or plate that will cover it!) over medium heat. Add kale, garlic, salt and pepper, and lemon juice, stir until well combined, and all of the kale is coated in oil. Cover the skillet and allow it to cook for 2-3 minutes. This will wilt the kale slightly, which should be bright green and softened. Remove cover, stir and cook off any remaining liquid. Adjust seasonings as needed, and serve hot! 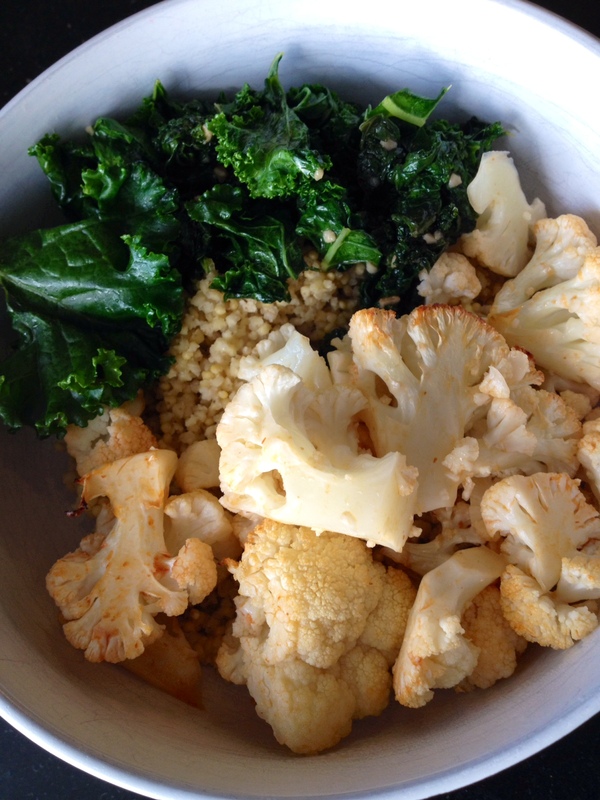 Kale pictured above with millet and cauliflower roasted in sriracha, about to be covered with SUPER SAUCE!! This entry was posted in on the go, powerful & potent, Quick Conjurations, simple and satisfying and tagged easy, healthy, quick, side dish, simple. Bookmark the permalink.